Image attribution: Marlene Gilson, ‘Mount Warrenheip and Eureka Stockade’ (detail), 2013, acrylic on canvas. Collection: Art Gallery of Ballarat. Purchased with funds from the Sir Wilfred Brookes Charitable Foundation, 2014. © Marlene Gilson 2013. 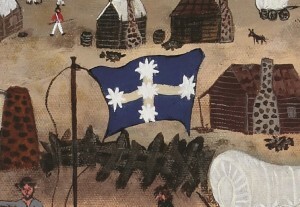 Marlene Gilson, ‘Mount Warrenheip and Eureka Stockade’ (detail), 2013, acrylic on canvas. Collection: Art Gallery of Ballarat. Purchased with funds from the Sir Wilfred Brookes Charitable Foundation, 2014. © Marlene Gilson 2013. Our films will be screened in entirety (alongside the productions of two talented other film-makers) at M.A.D.E Ballarat on Sunday the 7th December at 2pm. There will be a Q&A session with Jary and Lucinda and Leslie Falkiner-Rose and Erin McCuskey the other film-makers involved in the digital stories production at Sunday the 7th December at 1pm. From December 3 the films will also be viewable as part of M.A.D.E Ballarat’s permanent exhibition. There are a range of other events on in Ballarat on the day of the battle the 3rd of December, and on the weekend of Saturday the 6th-Sunday the 7th of December. Have a look at the calendar, below. Come find us and say hi! Our Digital Stories will be launched as part of the commemoration of Eureka Day, December 3rd, starting off with a Welcome to Country Smoking Ceremony led by Uncle Bryon Powell, with a commemorative service, and featuring the raising of the recreated Eureka Flag and the unveiling of the Pikeman’s Dog Memorial. When: 6:00am – 8:00am Wednesday 3 December. Where: Museum of Australian Democracy at Eureka, 102 Stawell Street South, Ballarat, VIC, 3350. Find out from the three filmmakers the great characters and tales they uncovered as they created Digital Stories for M.A.D.E’s exhibition. A conversation with Erin McCuskey, Yum Studio, Leslie Falkiner-Rose, Falkiner Media Services and Jary Nemo and Lucinda Horrocks, Wind & Sky Productions. When: 1PM Sunday 7 December. Cost: Free to Ballarat residents. $12/$8/ Under 5’s free. Bookings are essential. 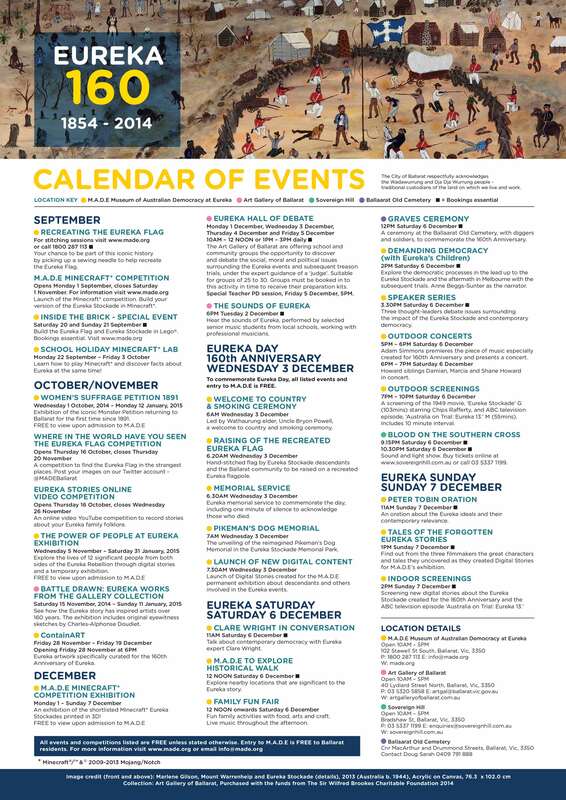 There are a range of events on in Ballarat to mark the 160th anniversary of the Eureka Stockade. Come along and don’t forget to say hi!